Look your best with this pair of black coloured formal shoes by Hush Puppies. This pair of formal shoes provides optimal flexibility, owing to the tpr sole, for free movement. 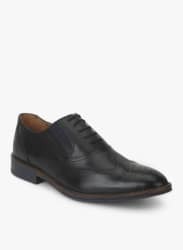 Team these up with semi-formal trousers and a crisp black shirt to look dapper.